Hello all - I hope you had a lovely Memorial Day weekend. Ours was different than planned, but really nice and relaxing. Poor The Tim ended the weekend with a full-blown cold, but that was the only bad part. Today, Kathy has lots of Yes or No questions. Let's see what I have to say. Is school out yet in your neighborhood? Nope. Though I think most schools will be finished for the year by the end of next week. No. We moved around a lot, and I really had no interest. Plus, most of the summer camps cost to attend, and my parents wouldn't have been able to afford it even if I had been anxious to go. Do you display your needles? A few. I have an old pasta tin that holds some of the straight needles I have that are pretty. But for the most part, my needles are put away out of sight of feline family members. 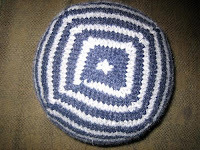 Have you been on Ravelry this week? Yes, just this morning. But I'll admit there are weeks that I don't look at it at all. Do you walk outside at night? Yes. 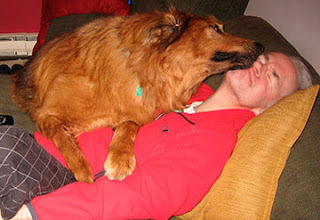 For one thing, on the nights that The Tim is working, it's my responsibility to take Dug for his evening walk. Admittedly, I would not want to walk around at 2 a.m. (not just in my own neighborhood, but anywhere! 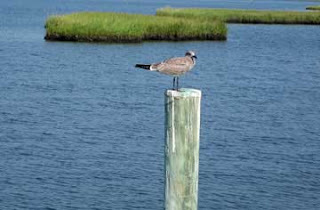 ), but there are usually a lot of people around outside, at least until about 10 p.m, and especially in the summertime. Do you think in metric? Nope. I understand the concept of a 2-liter bottle, but that's about it. I always remember one of my second-grade teachers telling us that by the time we grew up, we would be a) using the metric system exclusively, b) living in a completely paperless society, and c) speaking Esperanto. Go figure. Do you want a swap? I've enjoyed swaps in the past, and have fortunately never been unlucky. But I do tend to get freaked out with the deadlines and requirements, so I haven't participated in one for a long time. Are you afraid of mosquito borne illness? No. I mean, I'm not saying I don't think it could ever happen, but I'm pretty conscientious about spraying on/spreading on mosquito repellent, since I am apparently a 5-star meal in the Mosquitoland Zagat Guide to Good Eating. I despise mosquitoes. 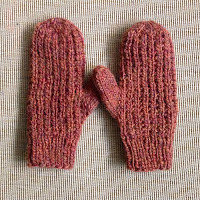 Have you knit a Christmas or Holiday gift for 2016 yet? I've completed one thing, and have started another. 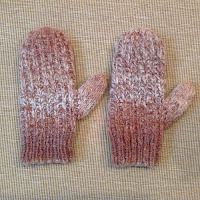 I hope to make some more things, but have planned very basic, simple knitting, and only for some of my nieces and their partners who appreciate it. What about you? Are you planning to watch the Olympics with a 2-liter soda, while speaking Esperanto to those around you? the prayers of the good, and the valor of the brave. May God bless them every day, and smile upon them especially today. Believe it or not, it's the Friday of Memorial Day weekend. I always find this time of year difficult, because I am not a fan of summer, though I do enjoy going to the beach. But I strongly believe that it should not in any way be 90+ degrees and humid already, especially when it's still only May! I hate that when it's July or August, but at least then I tell myself that's how those months are supposed to be. I like Memorial Day weekends when it's great to be outside but not miserable. And then June eases you into summertime. Clearly I live in a fantasy world. Anyway, I realize that it's been a long time since I've done a Friday favorites, so here is my Memorial Day Summer Kickoff Five Favorites for this Friday. 1. Family. I am always grateful for my family, immediate and extended. But every single person has been understanding, concerned, and supportive of our decision to stay home, and is holding good thoughts for Dug. And in our own little family, we are all happy to be able to spend time together and enjoy each other. Life is fleeting, and though I had to learn that lesson at a young age in a way I wish did not have to be, I'm glad that it's made me aware of it ever since. Whenever I remember that life is short for all of us and having someone, anyone, to love and love you is the point, I feel better about things in general. 2. Cool nights that are pleasant for sleeping. Being able to comfortably sleep with the windows open, and maybe even having to pull up the sheet over you at some point is one of the things I like best about warmer weather. 3. Our CSA. We signed up for the same farm share program as last year, and we got our first pick-up yesterday. Fresh strawberries, asparagus, spinach, radishes, eggs, salad greens, and fresh cheese - it doesn't get much better than that! 4. Planning our picnic. There's a better than 99 percent chance it will be in the house, but planning the goodies is part of the fun of anticipating the holiday if you ask me. 5. Bicycles. The other day when The Tim was not working, he was nice enough to take my bike to the local shop for a tune-up. (He rides his in all weather; I ride in nice weather only.) I'd wanted to do it for weeks, but it has been so rainy, I just didn't get around to it. So now my bike is ready to go whenever I am! I love to ride, and want to try to increase my distance over the summer if I can. There are so many great places to ride right around here, and even if it's too hot later in the day, the weekend early mornings are usually nice enough to get in a good long ride. So there you have it. As the saying goes, the best laid plans of mice and men often go awry ... but in our house, we just go with a new plan! I hope your plans whatever they are, go the way you would like. I hope you have at least five favorites that you can think about. And I hope that whether you have a long weekend or not, that it's a good weekend anyway. Hello and Happy Saturday! I hope you are enjoying your weekend. I'm taking a little break at the moment, and thought I'd go ahead and write a post. This morning I did some running around, attempting to get a few things accomplished since we will be away next weekend. I was slightly successful, but didn't do as much as I'd like since it started raining. Not pouring, but just enough to make being outside, even with an umbrella, slightly unpleasant. Anyway, as the title of the post says, knitting does still happen here. 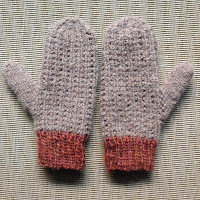 I keep looking at others' blogs, and they seem to get so much more knitting finished than I do. It doesn't bother me really, since I knit for fun, not as a contest, but I tend to take a while to actually complete a project. 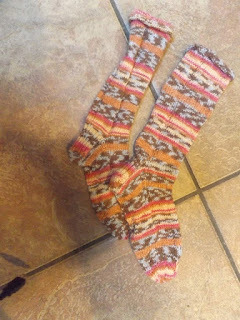 But I have one to show you today, and not only is it an FO, but it is a Christmas gift, so I consider that a two-fer! I think I've mentioned that I had a plan to make each of my niece's husbands a Turn A Square hat for Christmas. 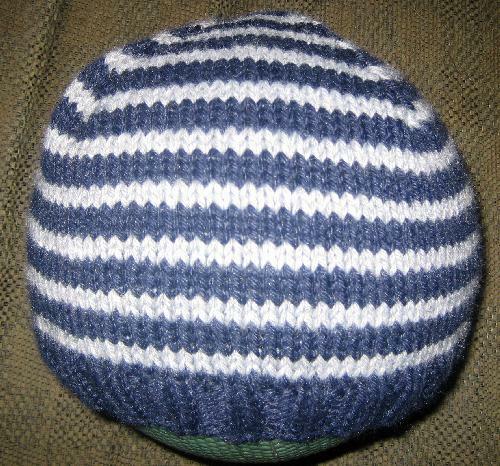 It's a pattern that I have made a few times, for The Tim, and he loves the resulting hats. He's also had a lot of compliments on them. I'm very pleased with the result, and am also more than pleased to already have a holiday gift ready. If you haven't tried this pattern, you should. 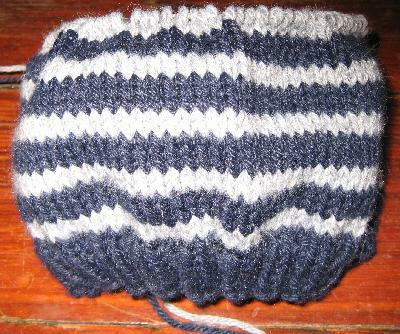 It knits up quickly, and there are an infinite number of possibilities for color combinations and stripes. Modifications: Since I used a regular long-tail cast on, I didn't need the third needle size the pattern mentions. 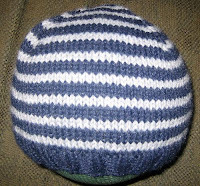 I did use the jogless stripe method, and otherwise, knit the pattern as written. For the record, the colors are more navy blue and light charcoal gray - its darker in real life than in my washed-out photos. I think rather than go ahead and start another one of these right now, I'll work on one of the things I want to make for my nieces. That way - at least in theory - I won't get sick of either thing right away, since I'm making multiples. And now I'm off to get a few things done around the house (exciting stuff like laundry! ), and enjoy the rest of my weekend I hope yours is good as well. Kathy's meme this week was truly a mixed bag. Which makes it all the more fun. Here are my answers, since I enjoy playing long so much (and frankly, was not in the mood to do a Ten on Tuesday with today's topic). Are you surprised I'm knitting lace with Big Yarn? Yes and no. I know lace can give Kathy fits, but I also know from personal experience that knitting a lace pattern with big yarn can be a whole 'nother story. The only lace project I ever knit and finished successfully was with bulky yarn. What's your favorite toenail polish color for summer? I almost always go for reds and pinks. Last summer when I splurged on a pedicure, they had a bottle of Essie Watermelon color and it it just seemed so summery. I may splurge this year and buy a bottle for myself, you never know. What do you do with an odd leftover knitted sock? I can't say this has ever come up. 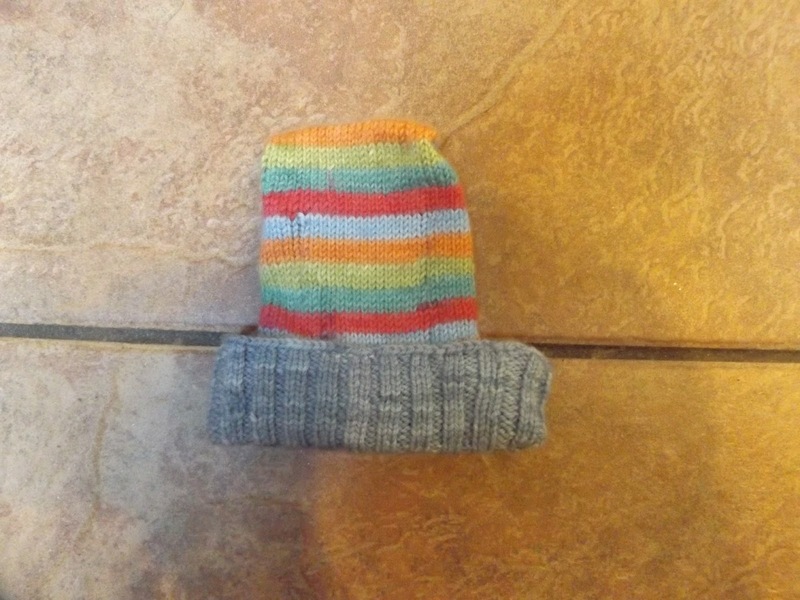 However, on occasion when a store-bought pair of socks has one sock that dies, I have been known to take the other and make it into a catnip toy for the kitlets. Have you ever had a tick? See above. But I am very conscientious with how I dress when I go into areas where they might be, and also spray repellent all over me, and check thoroughly when I get home. So clearly I am aware that it could happen. Nope. My life would be extremely difficult and terrifying if I were! 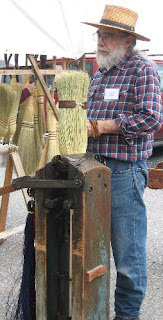 Knitting: Who are some of you favorite pattern makers? In other news that I must brag about, my sister and brother-in-law recently received the very first Clean Energy Award from the West Virginia Department of Environmental Protection for their work on the First State Capitol. My brother-in-law's law firm bought the building a few years ago for their offices, and as part of the renovations, it is now completely solar-powered, while remaining a historical landmark. 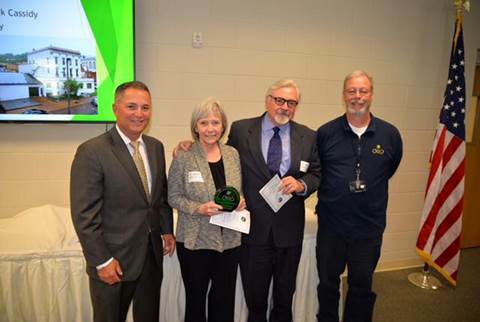 They are not just two of my favorite people (in the middle in this photo), but they are two people who walk the walk, so to speak. I'm really proud of them! Last Saturday, bright and early (well, overcast and early), I got on the bus rented by Loop to go to the Maryland Sheep and Wool Festival. I had spent all week hoping it wouldn't be a rainy day, since it was a really rainy week, and it poured rain here on Friday. Saturday it was overcast and misty, but as we got closer and closer, the sun actually showed up. So, no it wasn't rainy. But wow was it muddy! It made me glad that - after much indecision and angst about what to wear - I wore my hiking boots. The mud was the kind you sink into, and there were still some major puddles around. But it was not too cool, and not too hot, and didn't rain the whole day, so that all worked out. I didn't buy any yarn. I decided beforehand that unless I saw something that I could only get there, and that amazed me, I wasn't going to spend the money. I saw lots of really lovely yarn, but none that fell into that category. I did buy some buttons, and a teensy felted gnome, as well as a couple of antique prints I want to frame. Never fear though - everyone else on the bus seemed to have bought enough yarn to make up for what I didn't get! It was a fun day, mostly because I love seeing all of the animals. I'm sure you have seen variations of this on other blogs, so I decided to put my animal pictures together into one big one. I always find the guy who makes brooms fascinating to watch. 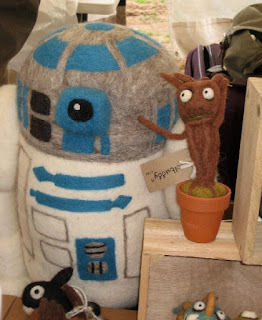 And these needle felted items were amazing - look at the R2D2! And then the booth where the artist makes whimsical pictures involving animals. This was my favorite one for this year, called "Kilts on Stilts." It's always a treat as well to see what everyone is wearing - both handknits and otherwise. I have to say, I didn't see nearly as many "interesting" outfits this year as I have in other years, but I did see some really beautiful things that people were obviously wearing to show off. 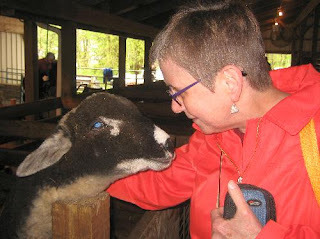 My very favorite though was this sheep, who reminded me of Dug. Not only did he come to the fence to see everyone, but if you petted him at all, he leaned into you. My friend Andrea took this picture of the two of us, and it's one of my favorite pictures ever. 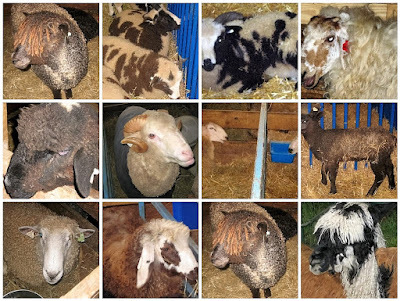 It had been a couple of years since I'd been able to go to Maryland Sheep and Wool, and I think I enjoyed it even more as a result. Who cares about mud and puddles when you are having such a good time? 1. What is the bulkiest yarn with which you have knitted or crocheted? I think it must be The Fabulous Elf hat knitted for my great-nephew Zach a few years ago. The yarn was Katia Fabula. 2. What is the biggest size needle you've worked? Size 15US, for the aforementioned hat. 3. Tell me about the WHOLE enchilada! I love cheese enchiladas, and though I think it's great when they have rice and/or beans, I'm really happy if guacamole is involved. 4. Would you rather wear a bulky bracelet, bulky earrings, or a bulky ring? I guess a bulky bracelet, but to be honest I don't really like bulky jewelry that much. 5. Name something oversized that you own and love. 6. 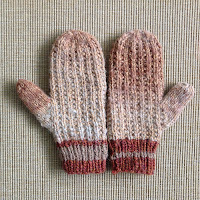 Which is bigger, the number of projects on your Ravelry project pages or the patterns you have faved? It's close - I have 102 projects listed, and 121 favorites. 7. What is the biggest vegetable you have grown? Zucchini. I've never lived anywhere that had a lot of room for big vegetables. 8. How large is your stash? c) Let's just say we may have a knitting problem. Really, not *quite* any of these. I have a larger stash than I need, but it pales compared to most stashes I have seen and/or heard described. I would say it's somewhere in between a and c, since I didn't buy any yarn at Maryland Sheep and Wool this year. 9. What's the longest vacation you have ever taken? Ten days, when we went to Ireland. 10. What is the longest you have gone without talking to another human being? I think since I have to talk so much at work, I enjoy not talking to other people when I don't have to! Before we get much more into the month, I wanted to do my monthly show and tell for what was included during April for Harry's Hundred. I am dismayed to report that I did not finish a single thing during the month - for this project or anything else. I got a few things started and then life intervened. But hopefully I can add some things during May. 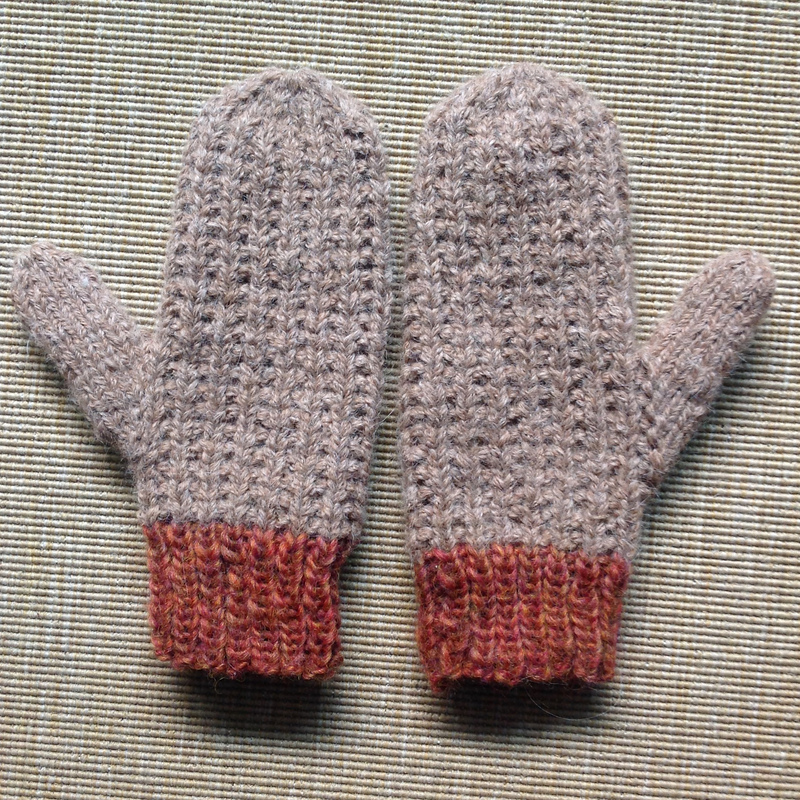 Again during April, GringaTurista (Ravelry ID) has been knitting up a storm. 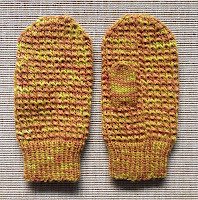 She has been making mittens galore for Syrian refugees, and they are not just lovely, but they look so cozy and warm! I think the persons who receive them will have warm enough hands that hopefully it will fill their hearts as well. But wait - there's more! 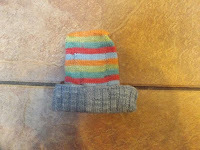 Kathy B made a baby hat and a pair of socks to send to Pine Ridge Reservation. 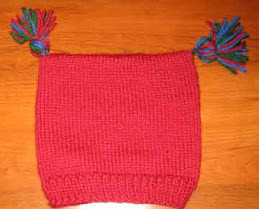 I love the colors of the hat, so cheery and it will look so adorable on a baby. So thankfully, these two knitters have provided a large increase in our overall tally. I am so grateful for the contributions and for the way people have embraced this idea. And I am having a blast seeing what everyone has made, and finding out where they are being sent/donated. Do you follow any blogs that are not knit or crochet blogs? Do you wind your yarn into cakes or balls? Usually into cakes. This is largely because whenever I decide to wind yarn into balls, 99% of the time I end up with a knotted mess. So I try to make myself pull out the swift and wind into cakes. 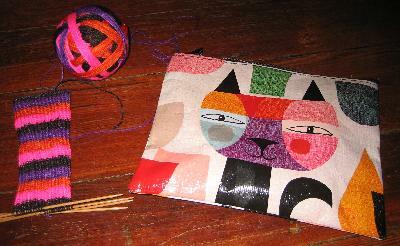 However, if yarn comes in a ball, it stays that way. I'm not a glutton for punishment! What is the longest stretch you can recall not knitting? About six years ago, I had surgery on my right hand, and was in a cast for about three weeks, followed by physical therapy for about a month after. I stopped knitting until about a week before the physical therapy was finished, because prior to that, it was either too painful or not possible. Do you bake or buy birthday cakes? Bake them. I love to bake birthday cakes. Granted, I make them from a box mix, but I enjoy the process, and like the feeling of doing something extra for someone's birthday. Now, keep in mind that I only bake birthday cakes for those birthdays that are important to me. If I was ever responsible, say, for a co-worker's birthday cake, it would be bought. Do you drink water every day? Oh yeah. So much that I usually slosh when I walk! Have you given up on knitting a certain garment? Yep. There have been more than one thing that I got into and then decided it just wasn't gonna happen. This used to bother me, but not anymore. 1. Stuck in an elevator? Thank God NO. Though this is largely because whenever possible, I take the stairs, as I am claustrophobic. 2. Lost on a hike? A few times I've thought I was, but then shortly after saw a landmark that re-oriented me. 3. Run out of gas? Since I don't drive, no. Growing up though, my father was one of those people who would drive for a while with the indicator on the Empty setting. Drove my mother nuts, and even though we did run out of gas a few times, neither of them changed. In honor of the upcoming day that is Mother's Day, Carole has asked us to list 10 Favorite Foods My Mom Used to Make. My first response when seeing this topic can be summarized below. You see, my mother loved to eat, but hated to cook. I mean, really hated it. And on the rare occasions when something was actually really yummy, my father warned us to not praise it too effusively, "Because then we'll have it every goddamn night." Which was the truth. My dad, on the other hand, loved to cook, but did a lot of traveling for work, so usually only did the cooking on weekends and holidays. Of course, even though I like cooking, it can get really tedious when you have to think of *something* for more than yourself every single day! But upon further reflection, I was able to think of the following that are things that I always fondly associate with my mom. 1. Coffee and toast. We drank tea as kids, but when you were sick, you got a cup of coffee with milk in it, and a piece of buttered toast which you were supposed to dunk into said coffee. It was the most perfect thing in the world, and I have never been able to replicate it. 2. Lemon meringue pie. Made once a year (summertime), from a mix, but with extra lemon juice. Delicious. I'm sure some of the deliciousness had to do with the once-a-year factor. 3. Butterscotch pie. Also once a year (fall), from a mix. See last two comments above. 4. Slaw for your hamburger from the grill in the summer. I know that iceberg lettuce (was there any other kind? ), onions, pepper, and mayonnaise were involved, but I'm not sure what else. I always thought it was the way things were sliced that made it so good. 5. Christmas Cheeseball. Still made every year by me, and also now by a couple of my nieces. It's not hard (we are talking about my mother) but it's yummy and a must-have in order for it to be truly Christmastime. 6. Kraft Macaroni & Cheese in the blue box. I seriously did not know you could make it any other way than from a box until I was an adult. And the "fancy" Kraft box stuff (I think it was called Deluxe) was horrible. I make killer mac and cheese now, but every once in a while when I'm on my own for dinner, I'll make myself a blue box dinner and I'm in heaven. 7. Christmas Kielbasa. She learned how to make this from my father's brother-in-law who was from Poland. Being my mother, she had to somehow make it sweet, so she cooked it in brown sugar. Only at Christmastime. And it's the only thing I miss as a vegetarian. 8. Beefaroni. Homemade, if you please, not from a can. We did have some class, you know. 9. Campbell's canned potato soup. She would add milk, diced onions, a big glob of butter, and lots of pepper. Again, not something I have been able to replicate to my satisfaction. 10. Peanut butter and jelly sandwiches. I think this was just because she made them, as I'm sure they were simply white bread, strawberry preserves (most of the time) and Peter Pan peanut butter. No fancy ingredients, just about as basic as possible. It's funny, my mom has been dead for more than 30 years, and I still think of her every single day, talk to her, miss her, and wish she was here to make some of these things. Mainly just so she would be here, you know? I hope if your mother is still around to drive you insane, you'll give her an extra kiss from me this coming Sunday. The lovely month of May. Granted, May 1st here in Philadelphia is dreary and cold, not the kind of weather you might expect. But I had no outdoor plans today, so it's fine with me. The Tim had to work, and so I just worked on some things here at home, though they are not things that are really that visible, other than clean laundry! 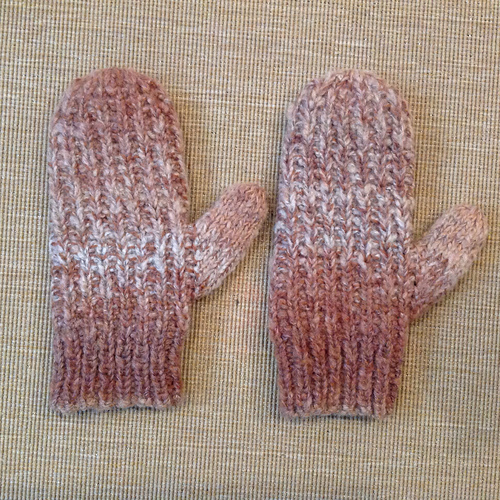 Anyway, I thought I'd share my latest knitting projects with you. These are both gifts. 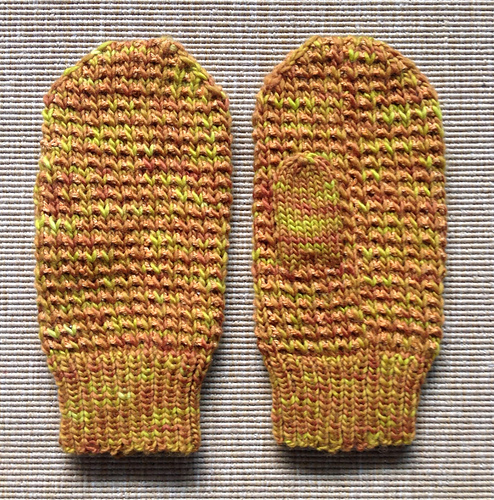 The first is a pair of socks for my niece Amanda. She adores Halloween, and this yarn colorway is called "Slutty Pumpkin." Pretty wild, huh? She doesn't wear socks to work, but always wears them when she is at home. I can easily imagine her wearing these to give out candy to trick-or-treaters. Isn't the project bag cute? I got it at Loop a while back, and it cracks me up. I posted a picture of the socks and bag on Instagram, and captioned it, "If only there was more color in this photo ... "
The next project is a Christmas gift, and is actually for Amanda's husband Patrick. 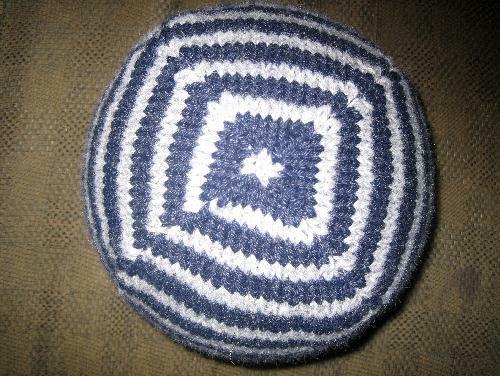 He has admired the Turn A Square hats (free pattern by Jared Flood) I've knitted for The Tim, so this is for him. The colors are actually navy blue and medium gray, but this was the best I could manage with my photographic skills. I'm almost ready to start the decreases for the top, so there's not much left on this project. 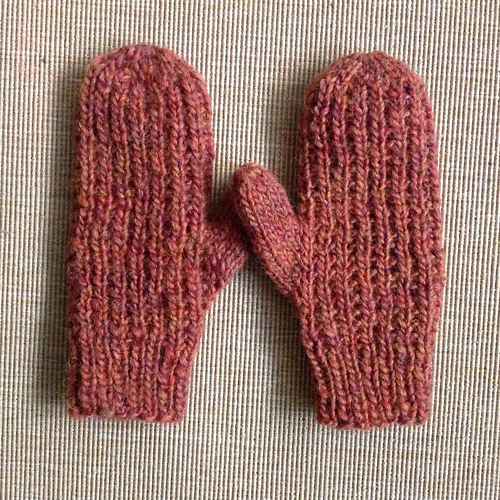 I want to make two others for other nieces' husbands for Christmas, but I'll probably take a break so I don't get sick of it. I'd forgotten how much fun this pattern is, and the color combo in person is really quite elegant. Then I headed over to Instagram to look at the others who posted with this hashtag. I found a whole 'nother set of ways to go down a wormhole, so unless you have nothing else planned for a while, I'd wait before taking a look. 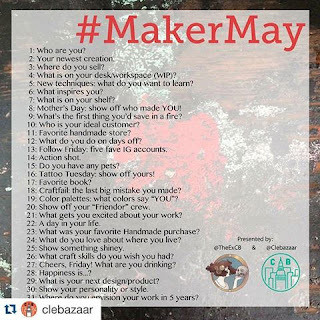 I am not participating, since I am not likely to have a photo to post every single day according to the prompts, but I like the idea a lot, and may use some of the suggestions for blog posts. 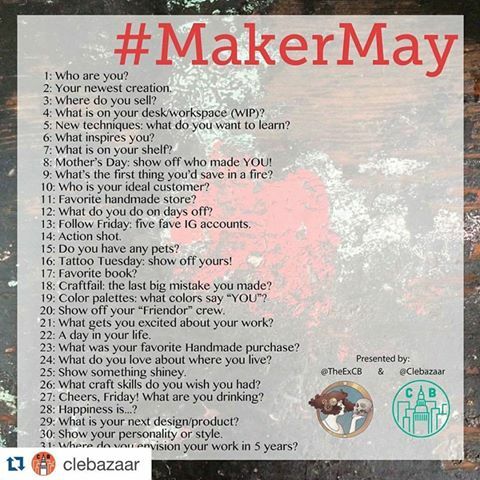 Anyway, I thought I'd share it with you, so that if you wanted to check it out and/or participate, you could start.